Militant Angeleno: The Militant's Epic Militant CicLAvia Tour 9.0!!!!!!!!! The Militant's Epic Militant CicLAvia Tour 9.0!!!!!!!!! Wow, its it really CicLAvia time again? It was just three and a half months since the last one, and The Militant can still remember that like it was yesterday. Now it's 2015 and we're in for -- count em -- four CicLAvia events this year: The Valley (March 22); Pasadena (May 31); Culver City/Venice (August 9) and the classic Heart of Los Angeles route (TBD October). This time around, we get to explore the 818 for the very first time in car-free mode, going along the Lankershim and Ventura boulevard corridors, with the Metro Red Line Universal City/Studio City (ugh, redundant and slashy) station's park-and-ride lot as a junction point and an activity hub. Now, The Militant did not grow up in the Valley per se, but he did have countless experiences in the SFV, and when it came to composing this guide, he just sat down, looked at a map, and pointed out some places that either meant something historically or personally. Eventually, he came up with 20 of them. It only took one on-site route visit to confirm things, and without any further a due, The Militant Angeleno presents you his Militant guide to the XIIth CicLAvia, or the 9th unique routing. ENJOY! (As consistent with previous Epic Militant CicLAvia Tour maps, this routing starts from the east and works its way westward). Metro Orange Line riders might wonder exactly what is this mysterious wooden building shrouded behind a fence and banners. Alas, it's one of the oldest surviving buildings in the San Fernando Valley. Built in 1893 as the Toluca Depot by the Southern Pacific Railroad along what was then the railway line from San Francisco to Los Angeles, it fielded both passengers and freight -- namely San Fernando Valley produce, such as peaches and oranges -- for a number of years. 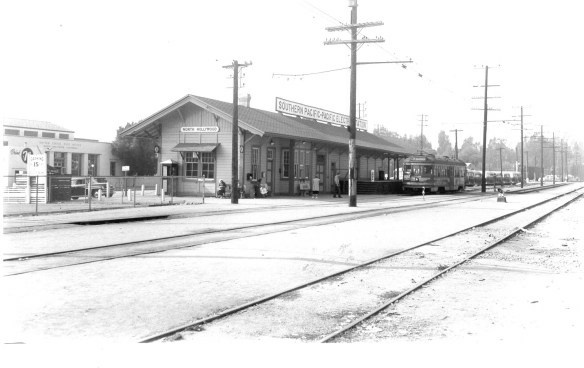 In 1911, the building was moved 50 feet to make room for the new Pacific Electric Railway, and the station served both the Southern Pacific and Pacific Electric until the last Red Car ran in 1952. Six years later, the Southern Pacific passenger trains stopped using the tracks and the station was repurposed as a lumber company's loading dock for freight cars. The line was abandoned in 1993, but soon after the new Los Angeles county Metropolitan Transportation Authority (a.k.a. MTA, now Metro), purchased the property as part of a construction staging area for the North Hollywood subway station. When the station opened in 2000, the transit agency announced a commitment to eventually restore the station, already a Los Angeles City Historic-Cultural Monument. Last October, Metro completed a $3.6 million renovation of the building, and even repainted it with the original colors the Southern Pacific built it with. The exact use of the station has yet to be decided, but it may or may not become a multi-use cafe, community space and Metro Customer Service Center. In the early morning hours of January 28, 1981, a fire broke out at what was then Cugee's Coffee Shop. While members of Los Angeles Fire Department Truck No. 60 were cutting a hole in the roof of the building, it collapsed, killing Apparatus Operator Thomas G. Taylor, a seven-year veteran of the LAFD. The fire was later discovered to be an arson fire, planned by the restaurant's owners to collect insurance, and paid Van Nuys barber Mario Catanio $2,500 to burn their restaurant down. The owners were each given 10-year prison sentences but Catanio was sentenced to 25 years to life. He was denied parole in 2012. When the current building was erected in 2001, a bronze memorial plaque for Taylor was placed on the corner of the building where Lankershim intersects with Weddington St. It was covered by The Militant in a blog post on North Hollywood in 2010. This dilapidated clapboard bungalow, considered "The Mother House of North Hollywood," on Weddington Street, nearly a block east of the CicLAvia route, has a long and storied history. In 1889, a farmer from Storm Lake, Iowa named Wilson Weddington visited his sister, who lived in the San Fernando Valley, and fell in love with the place. So much, that he not only moved his own family here, but he dismantled his house and had it shipped by train to what was then known as Toluca. Weddington, considered one of the founders of North Hollywood, had the house re-assembled in 1891 adjacent to a barley field. It was renovated in 1904, and later moved to make room for the El Portal Theatre. The building was moved three times down the same street, eventually resting in its current location, where it has been standing since 1924. The building, a Los Angeles City Historic-Cultural Monument, is in a state of limbo. There are plans to eventually restore it, but the question is where. There have been offers to move it to Highland Park's Heritage Square, but many North Hollywood residents, including one of Weddington's descendants, want to see it remain in the neighborhood. Before there was a "NoHo Arts District," there was the El Portal. Opened October 5, 1926 as a 1.346-seat Vaudeville venue and silent movie cinema run by Fox West Coast Theatres, and later, as part of the National General and Mann cinema companies, featured those moving pictures that talk. The theatre and its iconic (well, for NoHo folks, at least) Art Deco facade was designed by architect Lewis A. Smith, who also fashioned the Vista Theatre in East Hollywood and Highland Park's Highland Theatre. It screened films until closing in the 1980s. In 1994, it was a victim of the Northridge Earthquake and was rehabbed in the late 1990s, re-opening in 2000 as part of a re-development renaissance along Lankershim created with the opening of the Metro Red Line station, which in turn sparked the neighborhood's re-branding as the "No-Ho Arts District." What comes around, goes around. Today it operates as three theaters featuring mostly independent plays, dance productions and musicals, and it was also the recipient of the carpeting from its organ donor, the late Schubert Theatre in Century City. The twentieth-century female aviation pioneer and feminist icon had several ties to the North Hollywood (and adjacent) area: In 1935 Earheart moved to a house in nearby Toluca Lake -- her last residence (or at least, her last known residence...). A number of the planes she flew in her famed flights were designed and built by Lockheed in nearby Burbank. In 1971, a steel and fiberglass statue, sculpted by Ernest Shelton, was placed on this corner of Magnolia and Tujunga at the edge of North Hollywood Recreation Center. 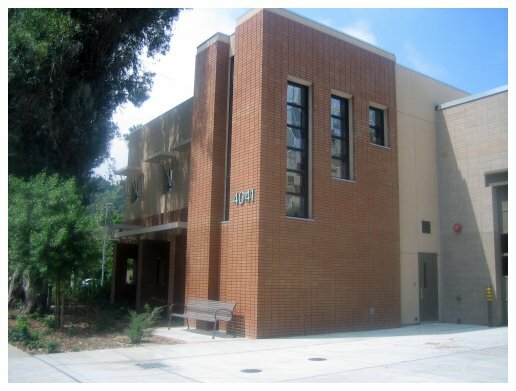 Just a few yards north on Tujunga, the Los Angeles Public Library's North Hollywood Regional Branch was renamed the "North Hollywood Amelia M Earhart Regional Branch Library" in 1981. In 2002, the statue was temporarily removed for renovation, and it returned in 2003, this time rebuilt in bronze. Love it or hate it, it's there, and it welcomes all to the NoHo Arts District. A project of the now-defunct Community Redevelopment Agency of Los Angeles, the quirky, $800,000 NoHo Gateway was built in July 2009 and designed by artist Peter Shire, known for his equally-quirky-but-not-nearly-as-controversial art sculptures in the landscaped (former Pacific Electric) median of Santa Monica Boulevard in WeHo. This was also covered by The Militant in his 2010 blog post on NoHo. What does the Militant think of it? Well it's, um, you know...but people will get used to it eventually (a Facebook page called "Tear Down the NoHo Gateway" has not had any activity for the past three years, so maybe it's a sign that people are warming up to this thing...). Such is art. The CicLAvia route cuts through the bewildering six-way intersection of Lankershim Blvd, Vineland Ave and Camarillo St. But look down through Vineland -- see that landscaped median? If you know your Los Angeles history, you know what that means. Like Leimert Blvd from the last CicLAvia, this, too, is an abandoned streetcar right-of-way. 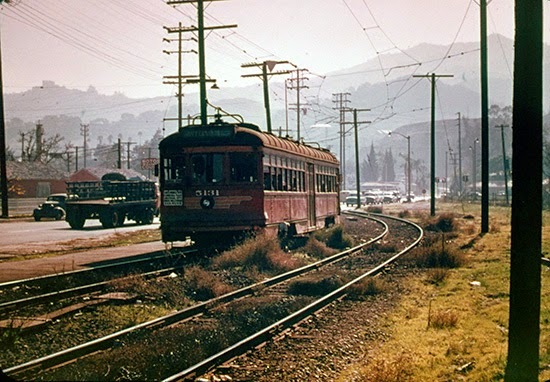 Vineland Avenue carried Pacific Electric Red Cars between the SFV and Downtown Los Angeles. From the other side of the hill, the Red Cars cut through the Cahuenga Pass (now the 101 freeway) and turned north on Vineland, where they once went all the way to San Fernando, Canoga Park or Van Nuys, all except the Van Nuys line closed down in 1938, with the final line closing in 1952. Just south of Chandler Blvd, the line through Vineland curved west (the diagonal wall at the Big Lots store on Vineland and Chandler is a vestigial remnant of this line) to join Chandler, where trains passed through the historic Lankershim Depot. This white building which bears the signage, "The Howard Colonial" is also a vestigial remnant of the Pacific Electric's San Fernando Valley line through Vineland Ave. It served as one of the PE's electric power substations (Number 30 to be exact) that supplied power to the overhead lines that gave juice to the Red Cars that ran past it. This Spanish Colonial-style church designed by Alhambra-based architect J. Earl Trudeau, who also designed Roman Catholic parishes in Culver City, South Los Angeles and Alhambra, has attracted famous parishioners such as actor Bob Hope -- who lived in nearby Toluca Lake and had his funeral here in 2003 (the corner of Lankershim and Moorpark was designated by the City as "Bob and Dolores Hope Square"). Directly west of the main church is the parish hall, which was built in 1937 and previously served as the original church structure. The architecture of the old church was based on the parish's namesake, the 1771 Mission San Carlos Borroméo del río Carmelo in Carmel. Have you ever seen service trucks drive on the Los Angeles River? How did they do that? Did they really drive all the way from Downtown? Well, no. from this bridge over the River, you can spot access ramps on both the north and south sides of the river; the one on the north side is accessible via a gated lot at the end of Agua Vista Street. Of course, anyone caught doing a RiverLAvia on Sunday , or any day, would be fined $1000. Though NBC and Burbank have become inseparable, their corporate relationship with Universal (and Later Comcast) has moved them west, and onto the Universal backlot. In February 2014, TV station KNBC 4 , KVEA Telemundo 52 and the NBC News West Coast Bureau moved into a new state-of-the-art digital facility along the Los Angeles River. 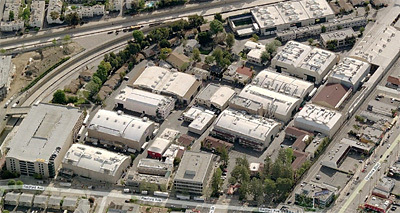 The old NBC studios in Burbank is now an independent rental studio facility called The Burbank Studios. This is also a big year for its Universal parent/partner; Universal City celebrated its 100th birthday this past Sunday. Give Fritz Coleman a bi ol' shout-out if you see him this Sunday. Yes, this adobe abode was the location where Lt. Col John C. Fremont and General Andres Pico signed the Treaty of Cahuenga in 1847, formally ending the frequent skirmishes between the U.S. and Mexico, and eventually paving the way for California to become an independent nation, and eventually a U.S. state. It all began here, people. Those northern Cali folks beta recognize! You'll have to go inside to experience more of the history, and if you want more, go to the Metro Red Line platform at the Universal City/Studio City station next door and read the art that adorns the station. Also, the actual table where the treaty was signed is on display at the Natural History Museum in Exposition Park as part of their Becoming Los Angeles exhibit, which The Militant wrote about in 2013. This pleasant California native plant garden was a streetscape and pocket park project by the Studio City Beautification Association done in 2009. Located literally where the Santa Monica Mountains meet Ventura Boulevard, it gives pedestrians a chance to connect with the natural indigenous habitat of the mountain range. With a dirt "hiking" path subbing for the sidewalk here, one can see California Golden Poppies, Matilija Poppies, Purple Sage, California Lilac and purple Verbenas. And since we've experienced an early Spring this year, many of them are already in bloom. No doubt you've seen this house numerous times on TV Land or in local syndication or (if you're old enough) on primetime on ABC from 1969 to 1974. It was selected by "The Brady Bunch" creator Sherwood Schwartz in 1969 to represent "California living," "a place that an architect would live in" and "not too affluent, but not too blue-collar either." But though the television show had that famous iconic staircase, the real house on 11222 Dilling Street is only a single-story, split-level abode. The show's crew placed a fake window under the facade's A-frame during location shooting to depict a second level. Here's an interesting tidbit about the Brady Bunch house: You already know about the history of the Weddington House. But did you know there's a direct connection between the two famous Valley houses? 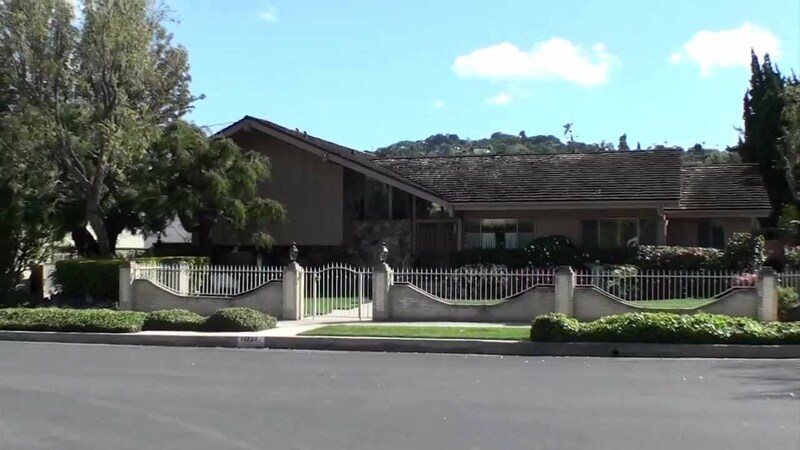 The Brady Bunch house was designed and built by Luther B. Carson (who, like Mike Brady was an architect) in 1959 on a then-empty lot after the construction of the Ventura Freeway forced them to move from their previous home nearby. He was already deceased by the time the house was selected by Schwartz for the TV show. His widow, Louise Weddington Carson (who died in 1994) was Wilson Weddington's great-granddaughter. Did you know that this two-block stretch of Ventura Boulevard has the highest concentration of veterinary hospitals/clinics in the entire City of Los Angeles? Well, neither did The Militant until he recently surveyed the CicLAvia route. In this section of Ventura between Colfax and Radford avenues alone, there are five veterinary facilities: Parker Pet Hosptial, Veterinary Medical Center, Animal Emergency Centre, Studio City Animal Hospital and Tully & LaBounty Pet Clinic. The Militant used to take his beloved K-9 unit (may his or her soul rest in peace) to one of those hospitals. Like Sunset Blvd's Guitar Row or Wilshire Blvd's Hair District, it's one of the many unofficial specialty retail districts of Los Angeles that makes this city so unique. And because there's so many pet health care facilities on this block, The Militant has thusly given this part of the street the moniker, "VETura Boulevard" (come to think of it, a famous cinematic pet detective had the name "Ace Ventura." Coincidence?). Do you know why Studio City is called "Studio City?" Because it's close to Universal Studios, right? BZZZZT! WRONG! (That's Universal City...) It's because of this place. Back in the '90s (er, the 1890s, that is), this area was called Laurelwood. With farming wrapping up by the end of the 19th century, it became a hotspot for real estate at the turn of the 20th. Mack Sennett, who already built Los Angeles' first movie studio in what is now Echo Park in 1912, decided to build a second, 20-acre studio on the banks of the Los Angeles River in this location in 1928. He sold the studio due to bankruptcy in 1933 to Mascot Pictures, changing hands over the decades to Monogram Pictures and Republic Pictures until the latter's demise in 1958. Then CBS started leasing, and later purchased the facility, and in the early 1960s it became the location where the network's own produced series were filmed. The classic TV shows "Gilligan's Island," "Gunsmoke," "My Three Sons" and "The Mary Tyler Moore Show" were all filmed on that lot. In fact, the large parking garage on the right before Radford meets the Los Angeles River was the site of the Gilligan's Island lagoon. Today, the studio is also the home of local television stations KCBS 2 and KCAL 9. 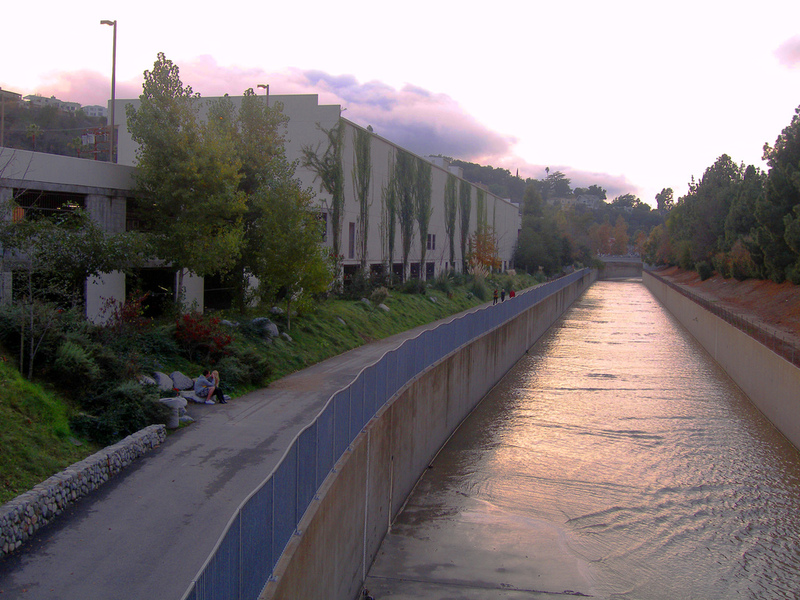 Yeah, so the Los Angeles River in the Valley isn't as scenic and green as what you see down by Griffith Park and Frogtown (except for this section, which is a few more miles upstream). But at least this picturesque greenbelt and walking path, which opened in 2004, is still much more pleasant and scenic than the other Los Angeles River crossing by Lankershim. If CicLAvia gets too crowded, you might want to use this route as an alternate. If you can't get enough of the river, you can re-join the greenbelt west of Coldwater Canyon, where a similar path runs west to Fulton Avenue. In the near future, a linkage path will connect the two linear river parks between Coldwater Canyon and Whitsett. Gentrification and hipsterization might be causing more segregation in our communities, but there was a time in our City' history when segregation in certain City institutions was the law. Remember the story of the African American Firefighter Museum on Central Avenue from previous CicLAvias? Well, here's the sequel to the story. For much of LAFD's history, only two fire stations, No. 14 and No. 30 (now the museum), were the only fire stations that allowed African American firefighters. 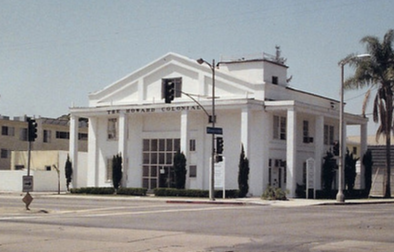 a series of events in the 1950s raised issues of racial integration in the LAFD and in 1955, two black firefighters and six white firefighters (who supported integration) were re-assigned to replace the all-white staff at this fire station on Whitsett Avenue, and it became the very first racially integrated fire station in the LAFD. It was not without controversy, of course -- many community members protested and used the new firefighters' unfamiliarity with the local streets and topography (they came from other parts of the city) as one reason for opposing the re-assignment. Eventually, in September 1956, all Los Angeles Fire Department stations were racially integrated. Although, this was not the original building of LAFD Fire Station No. 78; this was a new facility that was built in 2008. But you can still visit the original location along the CicLAvia route (adjacent to the Sportsmen's Lodge), which was on 4230 Coldwater Canyon Ave, just north of the 76 gas station. This was the very location where Jerry Seidman and business partner Isaac Starkman started their deli-food empire of celebrity clientele, 700-item menus and very mediocre, overpriced food. It's been said that an already-famous Andy Kaufman worked here as a busboy in the late '70s. In 2001, a fire damaged the restaurant, which was closed until it reopened to its currently-remodeled format in 2003. But if you want the Militant's advice, if you're hungry for a pastrami sandwich or cheese blintzes during CicLAvia, skip the long waits at this overrated joint and head a few blocks east to Art's Delicatessen on 12224 Ventura instead. Originally built as a place where Valley residents and visitors can experience the rapidly-vanishing rural lifestyle of the San Fernando Valley of the 19th Century, in the 20th century it became popular for its stocked fishing ponds, and a celebrity hang due to its proximity to the aforementioned studios on Radford Avenue, In recent history, its events center has become a venue for countless Angeleno wedding receptions, bar/bat mitzvahs, proms, quinceañeras, and other events. The Militant even had one of his high school reunions here. As you may or may not have heard earlier this week, this place will soon be undergoing some changes. Gone will be the beloved events center and scenic grounds, to be replaced by some outdoor retail mall type thingie. The hotel will stay though. The Militant doesn't know what to think of all this (as if The Valley really needs another Crate and Barrel), but in the meantime, come check out this unique Valley institution while it lasts. So there it is, take it. 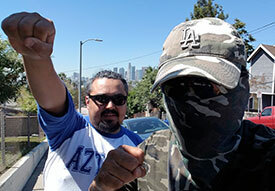 Happy CicLAvia this Sunday, and if you see The Militant on the streets, raise your fist for him! Thank you, Militant Angeleno. See you on the ride. 1. The Cobra Kai dojo from "The Karate Kid"-5223 Lankershim. "Fear does not exist in this dojo"
3. California Charlie's Used Car lot from "Psycho"-4270 Lankershim. Janet Leigh switches her car. 5. Lucasfilm headquarter offices-3855 Lankershim. 5. *Former site of Lucasfilm Headquarters. 7. Idle Hour Cafe-North Hollywood. Programmatic design. Bonus-the Bulldog from the Petersen is in the back. 8. 9/11 Memorial. North Hollywood park. 11. Skinny's-North Hollywood. Reservoir Dogs Tim Roth tells the commode story. 14. Millard Sheets mural Chase Bank-Ventura Blvd Studio City. Thank you (once again) for superbly sharing an accurate and detailed look at our local history. We are humbled to have Los Angeles Fire Department history included in this article, and appreciate the considerable effort you undertook to research and publish the information.